The Glacier Stainless Cookset series offers a line of heavy-duty, indestructible, backpack cooksets that get the job done. Brilliant, rust-proof and the strength that only stainless steel can provide, Glacier Stainless is the material of choice for cooking over coals or camp fire. Weight: 2 lbs. 4.3 oz. When it comes to outdoor cookware, they are commonly made from a variety of materials including stainless steel, enameled steel, aluminum, titanium, and cast iron, and many of those can also include various non-stick coating options as well. Stainless steel seems like an obvious choice for rugged cookware that would stand the test of time. It is rust and corrosion resistant, it does not weigh too much, and typically products made from it are nearly indestructible. The Glacier Stainless Cookset series is obviously made from lightweight stainless steel, but not just any stainless alloy. It is made from an 18/8 food-grade alloy, also known as 304 grade stainless steel commonly used for food preparation and dining. The first number, 18, refers to the percentage of chromium present and the second, 8, represents the percentage of nickel. 304 grade stainless steel also consists of no more than 0.8% carbon and at least 50% iron. The chromium binds oxygen molecules to the surface of the material to protect the iron from oxidizing, and the nickel further enhances the corrosion resistance which is why it is such a great alloy for use in the outdoors, and for food preparation specifically. 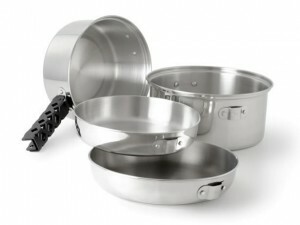 The Glacier Stainless Cookset is available in three sizes, small, medium and large. Each of the cooksets include two nesting pots, and a frypan that seconds as a lid for each of the two pot sizes. The interior of all pots and pans have a brushed finish that tends to hide scratches very well. The exterior, on the other hand, has a highly polished finish that shows every smudge and fingerprint, but comes clean rather easily. The small set includes a 1-quart pot, a 1.5-quart pot, a 6.5-inch frypan/lid and a 7.5-inch frypan/lid. The medium, a 1.5-quart pot, a 2.5-quart pot, a 7.5-inch frypan/lid and an 8.875-inch frypan/lid, and the large consists of a 2.5-quart pot, a 4-quart pot, a 8.875-inch frypan/lid and a 9.75-inch frypan/lid. All of the rims are double-rolled and the bottoms of the pots and pans have a circular ridge around their base to increase the strength and rigidity of the cookset. Each of the pots have a deep lip where the lids rest that further increases rigidity, making them very stout. 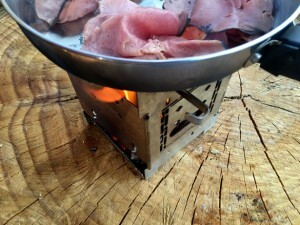 The circular ridge also aids in keeping the cookware from sliding while sitting on a burner. Each pot has a stainless steel clip attached to either end with rivets about 1″ below the rim of the pot. The pans/lids only have one of these clips riveted on about 0.5″ below the rim. Each cook set comes with one aluminum DiamondBack Gripper handle that easily clamps on to these clips to handle the hot cookware. All three cooksets also come with two flexible teflon cutting boards that also help to protect the finish of the pots and pans while they are nested, and a black nylon mesh storage bag to protect the outside of the cookset when not in use. Packing the cookset is as easy as placing one of the teflon cutting board disks in the bottom of the larger pot followed by placing the smaller pot inside of the larger pot, on top of the disk. Next, place the aluminum handle and any other kitchenware, cooking supplies and food that you would like to stow inside. Then place the smaller lid atop the smaller pot followed by the second teflon cutting board disk, and finally the larger lid. A short bungee is also provided to hold the lid securely in place while the cookset is not in use. To test the medium Glacier Stainless Cookset I performed two simple tests and then cleaned up the cookware afterward to demonstrate its capabilities, durability and how maintainable it is. 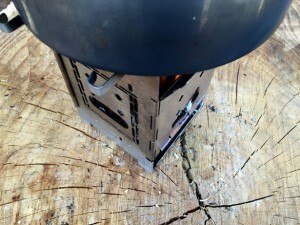 For the first test, I used the 2.5-quart pot filled with 1.5-quarts of water and no lid sitting atop one of the upcoming G2-5″ Folding Firebox stoves. 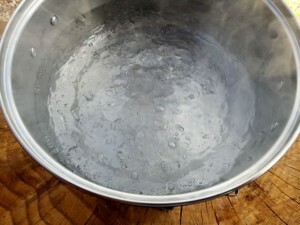 From the time that I first lit the stove to observing a full rolling boil was just shy of 12 minutes. Not bad at all for a simple wood-burning stove heating 1.5 quarts of water in a light breeze. However, I noticed that there was quite a lot of black soot all over the underside of the pot so I would have to be careful where I set it down after I dumped it. I purposefully left the DiamondBack Gripper handle clipped on to the pot just to see if it would become too hot to grip comfortably. After a full 12 minutes on the stove, the handle was really warm, but not too hot to grab comfortably with a bare hand. However, I did notice that the thin aluminum tab on the end of the handle was a little loose so I had to bend it back into place. As a result, I am a little concerned that the tab could weaken over time and break off causing someone to lose control over a hot pot or pan. A replacement handle can be found on Amazon as well as the GSI Outdoors website. 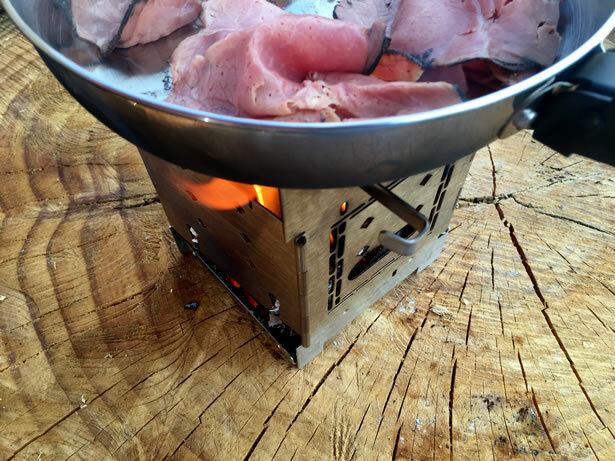 After dumping the water out and setting the pot aside, I added some more wood to the stove and placed the large frypan on top so I could begin warming up some pastrami for my sandwich. I did not have any liquid or oil of any kind in the pan so it got really hot really fast. I could hear the pan pinging and popping, and I could see the bottom distorting here and there as it cooked. After a few short minutes, my pastrami was done and I pulled the pan off the flame using the gripper handle. Like the pot, the pan also had a lot of the same black residue stuck to the underside that needed to be cleaned as well. The stainless was somewhat easy to clean provided you have access to hot soapy water, a steel wool pad, and lots of elbow-grease. The soot scrubbed off the pot rather easily. The inside only had boiling water so it was perfectly fine. The heat did cause the pot to discolor a little, but only above the waterline which I thought was interesting. As for the frypan, the soot scrubbed off without much effort, but the whole underside remained discolored. The inside however, appeared to be burnt and would not come completely clean no matter how hard I scrubbed. I even tried soaking it in hot water and used a Brillo pad without any luck. GSI Outdoors’ Glacier Stainless Cookset is a fairly rugged set of cookware designed primarily for outdoor camping out of the back of a car, not for expeditions or everyday use. At a few ounces over two pounds, the entire medium-sized cookset is rather lightweight. In order to keep the weight down, the stainless steel used in the construction is relatively thin-walled. Not so much that the cookware is flimsy, but it is certainly thin enough that the pots and pans will ping, pop and distort constantly as they heat and cool, especially the pans. The only real problem that I had with this cookset is that I overheated and burnt the bottom of the large frypan so easily. In hindsight, I think I should have used a little water or some kind of cooking oil while I was heating my pastrami. However, I do wonder if the same thing would have happened with a commercial-grade stainless steel pan. Even though the bottom of the pan is not a very pretty sight, it is perfectly fine and still usable. It will just take a bit more effort to clean each use. At around $65, GSI Outdoors’ cookset provides a fair amount of value for what you get. As long as you keep the pots and pans clean, and don’t let them get too hot, they will likely last you a very long time.